Elizabeth Taylor, 1988. Photo by Terry O'Neill. This post is in honor of what would have been Elizabeth Taylor’s 85th birthday, which is today. In February of 2011 I was just one of many who were dazzled by the tremendous jewels on display at the exhibit Set in Style: The Jewelry of Van Cleef & Arpels at the Cooper-Hewitt Museum in Manhattan. 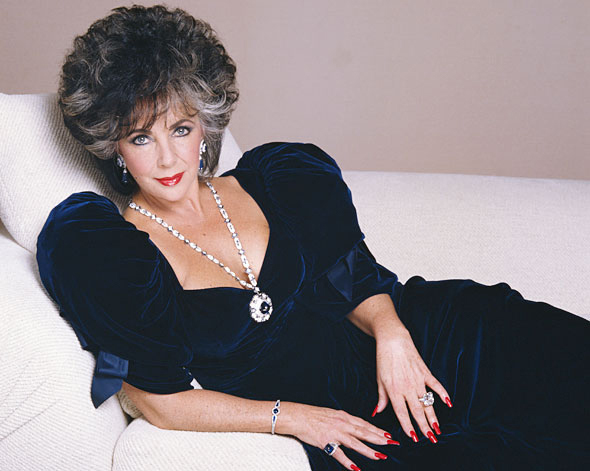 I remember absolutely loving a pair of earrings on loan from Dame Elizabeth Taylor—a pair of mystery-set sapphire and diamond pendant ear clips from 1984 and 1985. Liz is wearing them in the photo above and below is the picture I took of them at the exhibit. 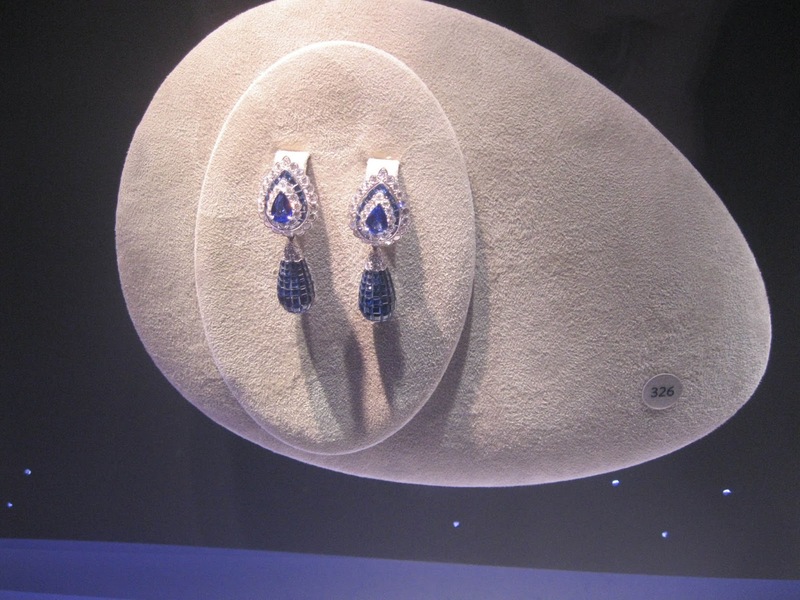 My photo of the earrings from 2011 at the show Set in Style: The Jewelry of Van Cleef & Arpels. The famed Christie’s auction of her jewels was in December of that year. Lot 68, the Van Cleef & Arpels earrings, sold the first night of the auction, going for $338,500, on an estimate of $150,000-200,000. The earrings recently came back on the market at Christie’s as part of the “Magnificent Jewels” auction on December 7, 2016. I went to see the preview, including Liz’s beautiful earrings. It was so nice to visit with them again! 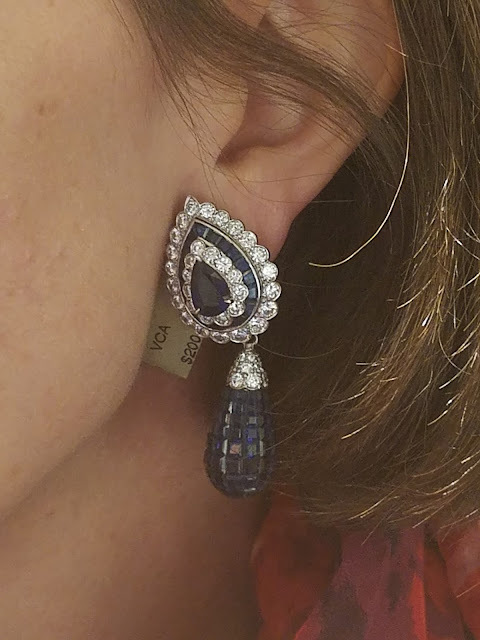 The earrings at the Christie’s preview, December 2016. The fabulous Michelle of Data in the Rough, who has an amazing Instagram account (@michellealdag), arrived at Christie’s and we met in person for the first time. She is a delight and I admire both her photos and her wide range of jewelry knowledge. She was there to view and photograph lots from the preview like I was and she suggested we TRY ON LIZ’S EARRINGS. They were held in a separate part of the preview, for the most expensive pieces, and I would never have dared to ask, but Michelle is fearless! Wearing Liz’s earrings! Photo by Michelle Aldag. Aesthetically I could not get over their beauty, the fire of the diamonds, and the brilliant blue of the sapphires, the mystery setting done so expertly all you saw was a field of blue. I could not believe the same earrings I had admired over five years ago were now literally in the palm of my hand! I have grown to be a huge Van Cleef & Arpels fan since I first saw that 2011 exhibit, so to be handed one of their vintage high jewelry creations was very special to me. And then to know Liz had owned the earrings and probably paid for them herself was almost overwhelming. My hands would not stop shaking as I fitted the clips on my ears and then raised each earring a bit higher on the lobe. 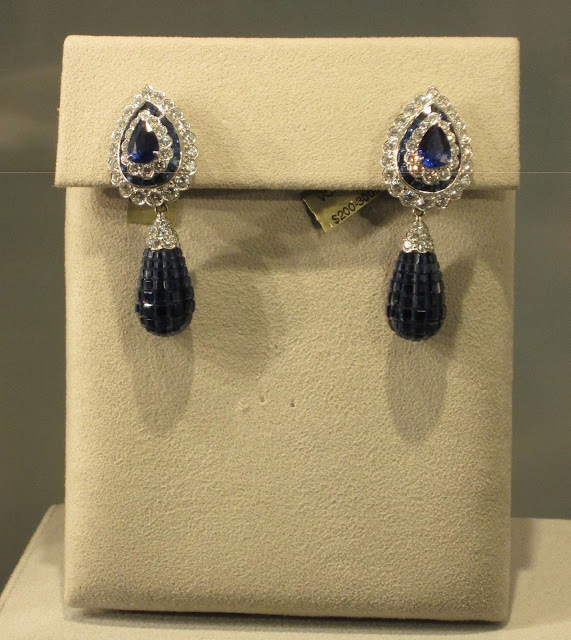 I was suddenly wearing Elizabeth Taylor’s Van Cleef & Arpels mystery-set sapphire and diamond earrings. I have to say, they looked amazing on me! All of my own pictures came out terribly since I was so nervous so these great shots are entirely due to the steady hand of Michelle, to whom I am hugely indebted. I love everything about these earrings. Photo by Michelle Aldag. 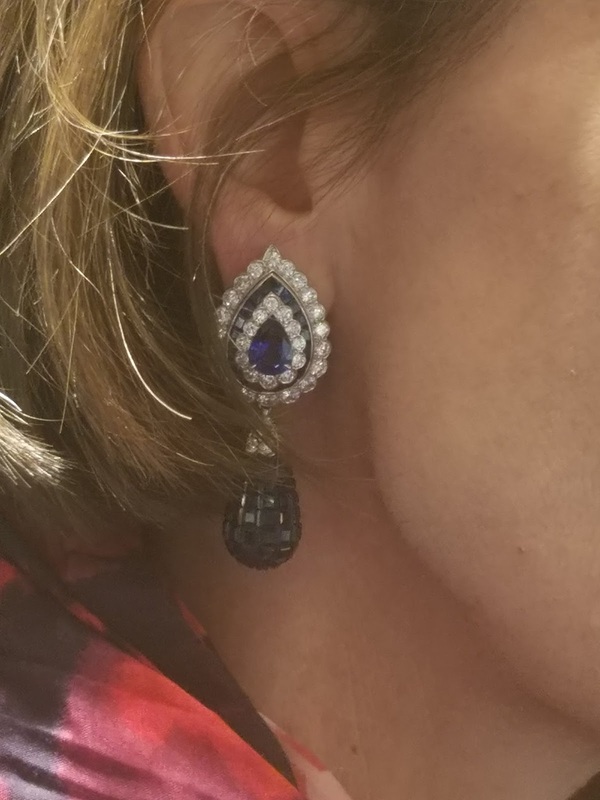 Liz’s earrings sold at auction this time for $307,500. I don’t know who bought them, it could very well have been Van Cleef & Arpels for their archives, in which case I might get another chance to visit with them in the future if they are shown in an exhibit, but of course trying them on was a once-in-a-lifetime experience. They will now always hold a special place in my heart! Primping with Liz’s earrings! Photo by Michelle Aldag. 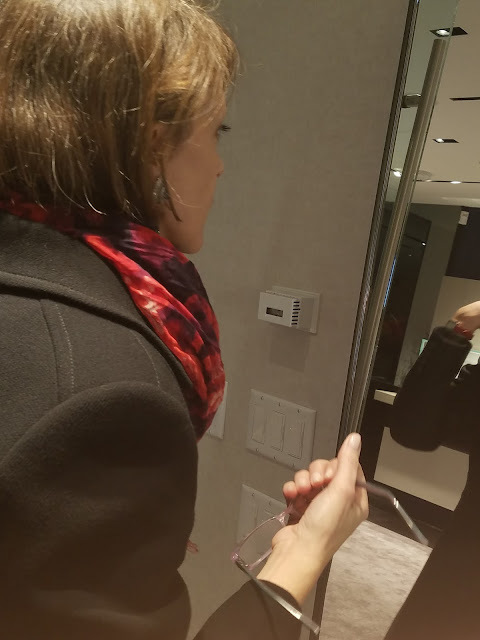 My mother told me later that she thought Liz would’ve gotten a kick out of seeing Michelle and I passing her earrings back and forth and trying them on. Knowing how generous Liz was with handing her jewelry around, I think my mother might be right! Thank you to Michelle of Data in the Rough for taking me along on a fabulous and amazing jewelry adventure, now one of my top jewelry memories, and for getting such clear and wonderful photos. I am truly grateful. I also tip my hat to Liz, for all the ways she is still adding beauty and glamour and fun to the world, nearly six years after she left it. A very happy birthday to Mrs Larry Fortensky! I couldn't resist. Liz was such a big personality and public figure since well before I was born. The train wreck of an Oscars Telecast last night (that I didn't watch) remind us how badly she is missed when movie stars didn't feel compelled to lecture us little people on their groupthink. I love this post! I really enjoyed the day as well! Those earrings look great on you! Can't wait to see what else will be at auction that we can try on! Great post. If only those earrings could talk. They are exquisite. This was quite a memorable experience & I am so glad you shared it with us. There was only one Elizabeth Taylor. She is remembered for her beauty, acting, life & kindness and now for her jewelry. Smart woman!